No surprises with Wadebridge and Padstow CN having the greater number of second homes. However, it was a close call between Camborne, Redruth and Pool CN and China Clay CN with the least, having 1% and 0.9%. After my previous post on second homes by parish, here is the list of second homes per the Cornwall Council Electoral Divisions, all 123 of them. I have written a few blogs on second homes and their numbers. Previously, I have looked at my home town of Porthleven and to compare with other areas, I also looked at Looe and Padstow. Now I have the most up to date (up to 27/11/2012) details on the numbers of second homes in the towns and parishes in Cornwall. Not all town and parishes are the same size, so I will give the highest number of second home in numbers and percentage. Porthleven: 1,693 dwellings – 151 Second homes – 8.9% and for Porthleven and Helston South: 2,166 dwellings – 155 second homes – 7.2%. For the other Helston CC Divisions: Helston North – 2,515 dwellings – 216 second homes – 8.6% and Helston Central: 1,803 dwellings – 23 second homes – 1.3%. As for the total number of second homes in Cornwall, there are 14,446. This is out of a housing stock of 260,077. This is 5.5% of all dwellings which are classified as second homes. For those interested the number of those which are classified as empty: 6,247 – 2.4%. I will at a later date, work out the numbers by town. It would be easy and simplistic just to look at the number of homes and the number of people on the housing register and that would solve Cornwall’s housing problems, like some have suggested. But that would be wrong, as second homes do contribute to the Cornish economy. However, like I have said before, there is a fine line of contributing, or having a negative impact on the local community and economy. What I believe must happen, is primary legislation being made that to turn a dwelling into a second home, or holiday let, it would require planning permission for a change of use. Like you would need to change a dwelling into a shop or vice-versa. That way they can be monitored, and with the right policy, stop these types of dwellings having a negative impact on local communities. More numbers to come on towns, Community Networks and CC Electoral Divisions. That is if you are interested! Cornwall Council’s Cabinet is set to introduce large-scale changes (if fully approved) to certain areas of Council Tax discount. It is recommended to stop the second home discount, currently set at 10%; change the discount on an empty property, and introduce a premium charge for those dwelling that have been left vacant for long periods. I am sure the first change of ending the second home discount will be welcomed. It is a bone of contention with permanent residents that this discount is still available. It used to be up to 50%, but this was changed a few years ago to 10%. Now from 2013, there will be no discount. With the removal of this discount, Cornwall Council will receive an extra £1.6 million in Council Tax revenue. I very much welcome this change, though, I have one small concern. This concern is how does the council keep a simple track on the number of second homes in an area? The discount was a good way of knowing this. With the removal of the discount, it will be a lot harder to track the number of second homes in an area. Another big change is on the Council Tax discount for an empty dwelling. It is proposed that if the dwelling is undergoing major repair/renovation, the owner will get a Council Tax discount of 50% for the first year only. They will then have to pay the full amount. This is a change from an exemption for one year, and then the full amount. If a house if not undergoing repairs, and is just empty, a discount of 100% will be given for the first month only, thereafter the full council tax will be applied. With so many long-term empty dwellings in Cornwall, the council is set to introduce a levy, or premium for those dwelling that are left long-term empty. This will be an extra 50% change. So if a dwelling is vacant for over 2 years, the owner will be required to pay 150% of the Council Tax. 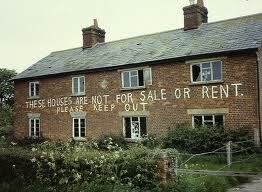 It is hoped this will encourage owners of these long-term empty dwellings to bring them back into use. I believe the council is taking the right steps in these proposals and I hope the Cabinet will adopt them this Wednesday. These changes will be in effect from 2013/14 tax year. The full report is HERE. The meeting is webcast from 10am via the Cornwall Council website. It is not often a few days goes by without hearing Cornwall is full of second homes. It is a hot topic in Porthleven too. But, how much of the rumours are true. How many houses in Porthleven are in full time occupation, part time, or holiday lets? In percentage terms this equates to 9% of houses which are 2nd homes. If you include holiday lets the percent of housing in Porthleven is 13% that is not in full time occupation. Compare this with other similar towns to Porthleven like Looe (2,923 banded houses) and Padstow (1,831 Banded houses). Now, holiday lets do play an important part to a town’s economy with visitor spend and employment. Trades people also get work from lets. So it is not all doom and gloom with holiday lets. They are an important part of a tourist town’s fragile economy. However, better planning rules could be in place to make sure the balance is just right. Lets now take 2nd homes. Porthleven has 153 of them that apply for the 10% discount on council tax. It is worth noting that the figure of second homes could be higher if a owner chooses to pay the full council tax. Unlike holiday lets which are run as a business, second homes are not. These are generally used for the benefit of the owners. As when not in use, lay empty for large parts of the year. A huge problem with second homes is to the housing stock. With less rental leads to higher prices being demanded. An average rent for a 2/3 bed property is over £600 a month.This is unaffordable to many people. It also has an affect on house prices if a house is in a desirable location, or seen as an investment opportunity. The sale price of the average house in Porthleven is around £180,000; again unaffordable for many due to low wage, bank reluctance to lend, or can’t save up a big enough deposit. Imagine if only half of these 153 properties were available for long term affordable rent. It would go a long way to solve the housing problems in Porthleven. It would also mean you would not have to extend the town planning boundaries so much to meet the housing need. This can only be good for a community. The Government is planning to allow all local authorities not to apply a discount on council tax. Currently it is law, and a local authority can offer anything between 50% and 10%. Cornwall Council only allows a 10% discount. Now if the discount stopped, how would we know how many houses not in full time occupation? The real danger is the number of second homes would be unmonitored and you would not know how many there are. Therefore, if the discount is stopped there must be some other way of keeping a record on the number of second homes. I am not totally against second homes, but (and it is a very big but) you have to have some sort of balance between second homes and full time use. This balance must also be backed up by legislation that is enforceable to limit the number of second homes. Or else you end up with at least 49% of housing stock like in Padstow not in full time occupation.